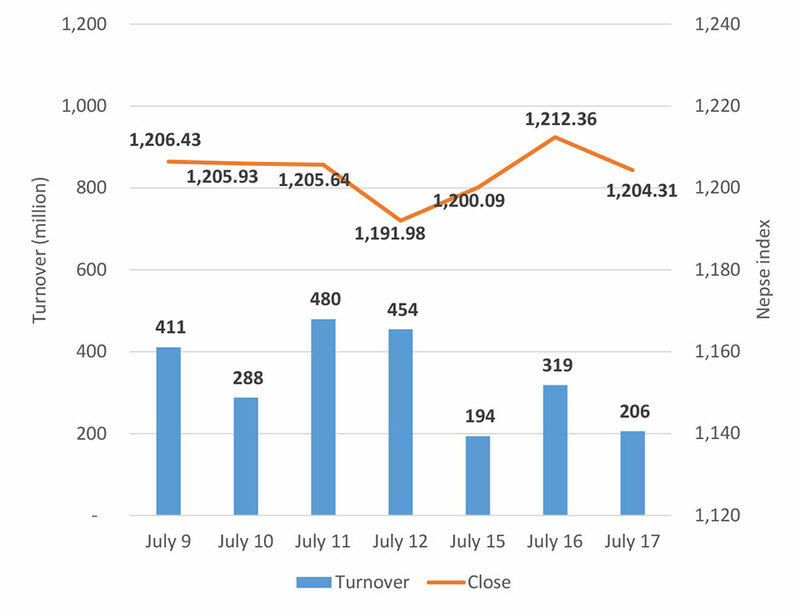 KATHMANDU, July 18: Stocks came under pressure for most of the session on the first trading day of Fiscal Year 2018/19 on Tuesday, as the benchmark Nepal Stock Exchange (Nepse) index was not able to sustain gains from previous trading days. Eventually, the index closed at 1204.31 points -- 8.05 points lower compared to Monday. The beginning of the fiscal year failed to bring enthusiasm among investors amid lack of any major financial or economic news. As a result, investors appeared cautious during the day's trading. Total turnover stood below average as only Rs 206 million worth of shares were traded in the bourse. Most of the sub-indices closed in negative territory. Hotels group declined the most as it was 2.88 percent down. Hydropower sub-index also lost 2.62 percent. Further, the sub-indices of Manufacturing & Processing and Insurance groups also ended the day in red. On the other hand, sub-indices of Trading, Others and Finance segments rose by 1.42 percent, 0.7 percent and 0.62 percent, respectively. Among the active stocks, shares of Nabil Bank Ltd posted the highest turnover of Rs 58 million on Tuesday. Next on the list was Nepal Life Insurance Company Ltd which registered total transactions of over Rs 8 million. Furthermore, Nepal Bank Ltd, Nabil Bank Ltd Promoter Share and Nepal Investment Bank Ltd recorded turnovers of Rs 6 million, Rs 5 million and Rs 4 million, respectively. Rairang Hydropower Development Company Ltd led the table of gaining stocks as its share price surged 6.76 percent. Kankai Bikas Bank Ltd and Nepal Hydro Developers Ltd also saw their shares gain over 4 percent each. Similarly, Goodwill Finance Company Ltd, Ngadi Group Power Ltd and Gurkhas Finance Ltd were the other top gainers of the day. In the flipside, stocks of Bottlers Nepal (Terai) Ltd, Nepal Insurance Company Ltd and Gandaki Bikas Bank Ltd logged the worst performance of the day as their share prices plummeted over 5 percent each. Likewise, shares of Mithila Laghubitta Bittiya Sanstha Ltd, Chilime Hydropower Company Ltd and Shikhar Insurance Company Ltd fell by 4 percent each. On news front, Capital Gains Tax (CGT) of 7.5 percent will be levied on secondary market effective from Tuesday. National Life Insurance Company Ltd has launched 60 percent rights issue from Tuesday. After the issue, the company will meet its minimum capital requirement of Rs 2 billion. Correspondingly, Panchakanya Mai Hydropower Ltd also commenced its Initial Public Offering (IPO) of 1.1 million units of shares on the day. ARKS technical analysis model indicates the market retracing after two days of advances. The index has been trading range bound near the 1,200-point level for a week, suggesting indecision in the market. Both Relative Strength Index (RSI) and Moving Average Convergence/Divergence (MACD) also imply lack of compelling momentum in the equity market.